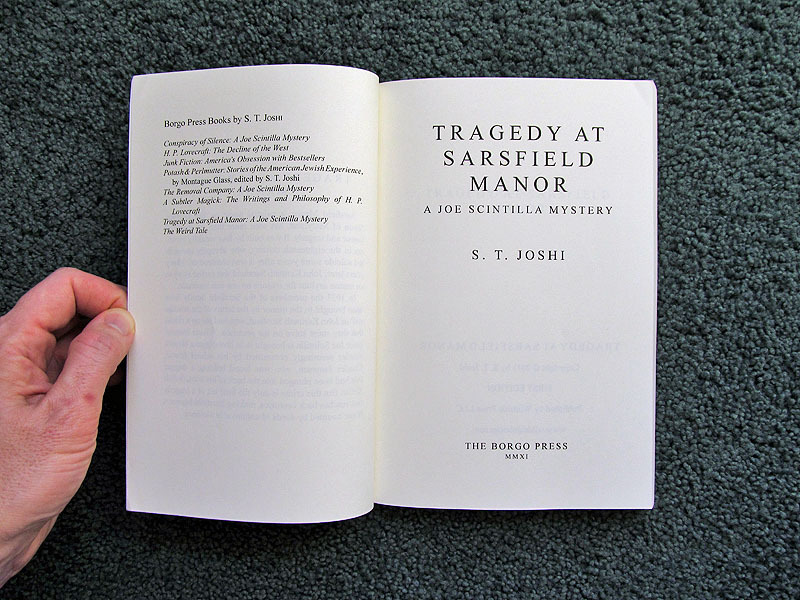 Book Notes: S. T. Joshi's "Conspiracy of Silence " and "Tragedy at Sarsfield Manor"
In two earlier posts I wrote up a few thoughts about two of S. T. Joshi's Joe Scintilla mysteries. I've been working my way through the series as preparation for reading Mr. Joshi's The Assaults of Chaos: A Novel About H. P. Lovecraft. I figured that I should read his earlier works of fiction before I took up his new book. The two latest Joe Scintilla mysteries are entitled Conspiracy of Silence and Tragedy at Sarsfield Manor. They were published in 2011 in a single volume, a so-called Wildside Mystery Double. That is, you read the first story, flip the book over, and then read the second story. It's a fun way to package the stories, in the spirit of the old Ace Double paperbacks. 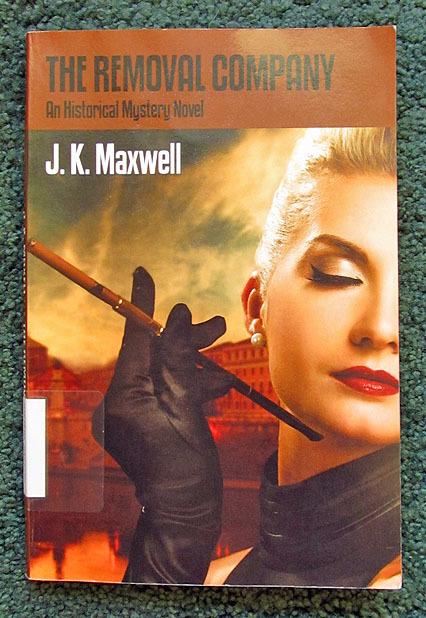 Miss Crawford is from a wealthy family, which is a good thing, since, as Scintilla observes, paupers don't have money to hire private detectives. Now that she has turned eighteen, she can spend some of her trust fund to hire Scintilla to prove that her father James Crawford did not murder her uncle Frank Crawford twelve years earlier. The problem is that her father confessed to killing her uncle as soon as the police arrived at the family mansion on that fateful night of March 19, 1924. There doesn't seem to be a mystery here. There was a body on the floor and a doctor in the house. It seemed to be an open and shut case, but Miss Crawford is convinced that her father is innocent. Scintilla isn't immediately convinced, of course, but the country is still in the middle of the Great Depression, and he could use the fee. So he takes the case. I won't reveal the details of the mystery, except to say that old family secrets are brought to light and the solution to the mystery turns out to be a genuine surprise, at least it was to me. 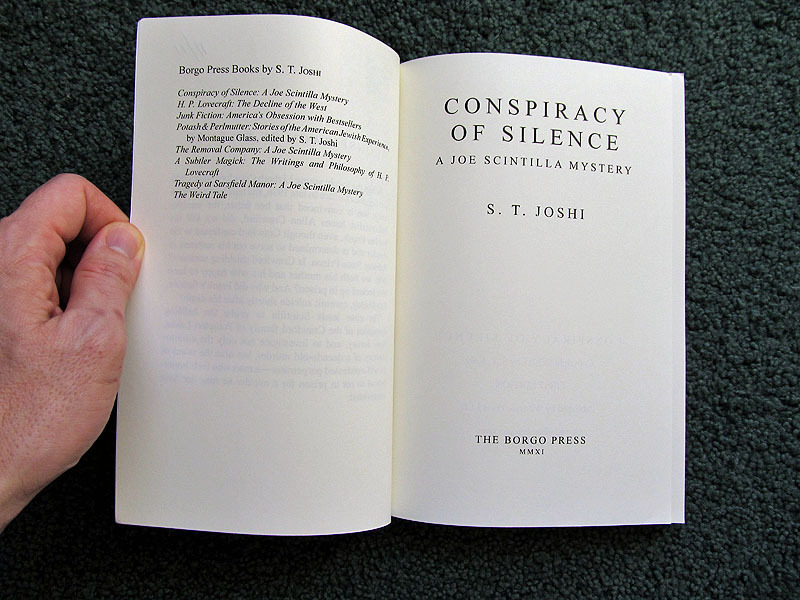 As I mentioned in my earlier posts, I'm not much of a mystery fan, but I genuinely enjoyed Conspiracy of Silence. Mr. Joshi constructs a good plot, and I had fun following it. He is still weak on atmosphere. I complained about how he handled the Italian sojourn in my discussion of The Removal Company. This time around Scintilla travels to Mexico in pursuit of a promising lead, and the atmospheric writing is still lacking. Apparently, Mexico is hot, dusty, and south of Texas. That's about the extent of Mr. Joshi's scene setting. He can do better, I think. Here's another, smaller problem. Mr. Joshi doesn't seem to know much about guns. (This is true of a lot of writers, sad to say.) Shotguns don't fire bullets (see page 84). They fire shot or slugs. Most amateurs load them with shot. With shot all you have to do is point and shoot in the general direction of the target. So when Joseph the family butler takes a shot at Scintilla, I'm sure that he was using shot. Even worse, though, Mr. Joshi has Scintilla shoot the gun out of a villain's hand (see page 145). This is a terrible cliché. If you ask professionals who carry a firearm for a living, you'll learn that they aim for the chest or, if they're especially good shots, the head. No one tries to shoot a gun out of someone's hand. Why? It's a small target that moves around a lot, so it's hard to hit. I'd like to see future books in the Scintilla series improve in the these two respects, i.e., the atmosphere and the gun play, especially the former. As I've mentioned before, atmosphere, mood, ambience  that's what I like best about mysteries. 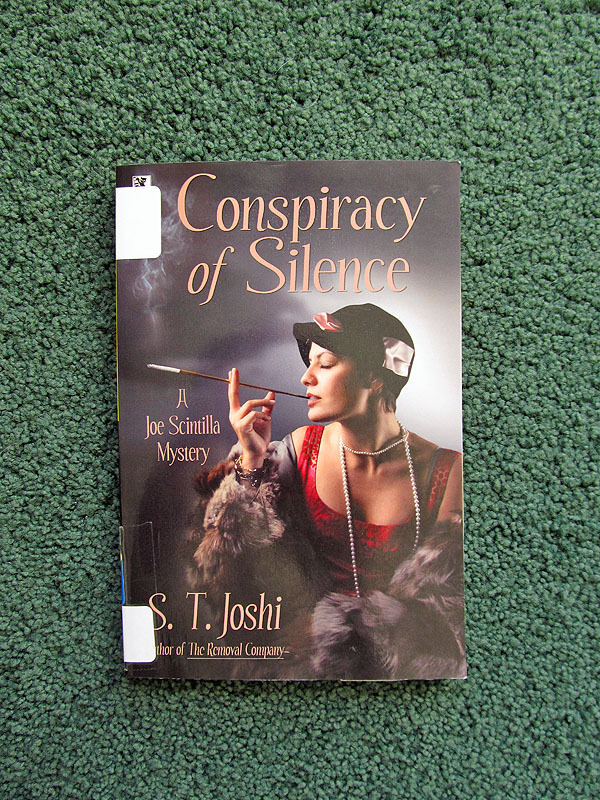 Tragedy at Sarsfield Manor is about half as long as Conspiracy of Silence. The mystery is not as well constructed. I didn't have any trouble spotting the murderer, but the manner in which the murder was committed struck me as rather improbable. Maybe you'll think otherwise. But the writing is generally good, and there's even an unexpected Gothic interlude. The Scintilla stories are narrated in the first person. 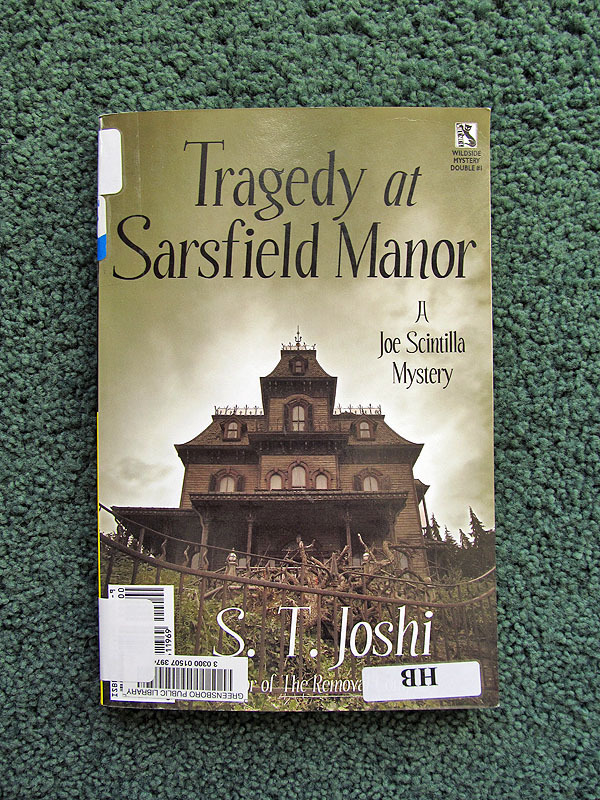 At the beginning of Tragedy at Sarsfield Manor we learn that Charles Jameson, one of Mr. Scintilla's college friends, is in jail under suspicion of murder. Scintilla comes to his aid, somewhat skeptically at first, of course. At this point in the story his friend takes over the narration for roughly thirty pages. It's late 1937, and Charles Jameson is now a classics professor. He comes from a wealthy family, but it's clear that he doesn't normally have much to do with his relatives. The will of his recently deceased uncle John Kenneth Sarsfield sends the family to Sarsfield Manor to carry out a strange request. The estate will go to the one who solves an enigmatic riddle. It seems very silly to Charles, but there's no way around the will. As Charles tells his story to Scintilla, we learn the history of the manor and four brothers who built it in 1765. The brothers Sarsfield were devoted to the occult, it seems, and for some unknown reason all four committed suicide on June 16, 1780. In short, we get a little Gothic tale, unfolded by Mr. Joshi under the obvious influence of his literary learning. This portion of the book is well done. In a bizarre turn of events Jameson is accused of killing his aunt Judith, one of the other potential heirs to the Sarsfield fortune. Unfortunately for him, everyone saw him hovering over her body with his hand on the knife sticking out of her back. Scintilla springs into action, going to the manor to question everyone and investigate the mysterious murder. Along the way, the riddle in the will is solved, more family secrets are unearthed, and the mystery is solved. As I mentioned above, I wasn't too impressed with the solution of the mystery. So that was somewhat disappointing, but overall I enjoyed Tragedy at Sarsfield Manor, just not quite as much as Conspiracy of Silence. Scintilla has an implausibly large working vocabulary. Here are some of the five dollar words that he employs: 'avuncular', 'stertorous', 'truculent', 'acclivity', 'penumbra', 'juxtaposition', 'anomalous', 'appurtenance', 'declivity', 'odiferous', 'plangent', 'phlegmatic', and 'orotund'. Yeah, yeah, I know that Scintilla studied at Johns Hopkins University back in the day, but his word power is a bit much at times. Philip Marlowe plays chess and reads T. S. Eliot, but he never sounds like a toff. So maybe Mr. Joshi could tone down the highfalutin language in the future installments of the series. My most significant complaint about the Scintilla stories as a whole, and this goes back to my earlier posts, is that although Scintilla is said to have studied philosophy before he became a private detective, we don't get much of an idea as to how his education led to his choice of professions or how it influences his work as a detective. This is such an unusual backstory that it cries out for elaboration. So far in the series, though, it seems rather pretentious. More needs to be made out of it. Most private detectives are former police officers. So how did Scintilla get into the business? How did he survive? How did he become such a good detective? I'm hoping that we'll learn more about these aspects of his life and career as the series continues to develop. In conclusion, I enjoyed the two most recent Scintilla stories, and I'm looking forward to more of them. But now that I've exhausted the series, at least until more titles appear, I can move on to Mr. Joshi's Lovecraft novel. So I'll soon be blogging my thoughts about The Assaults of Chaos. 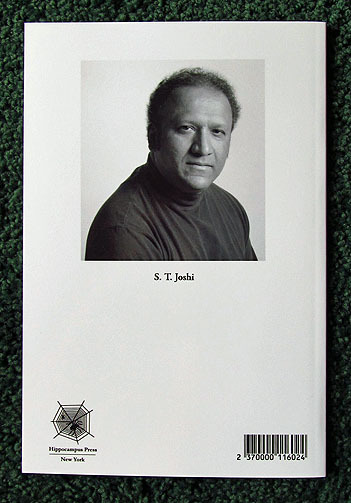 Book Notes: S. T. Joshi's "Suicide in Brooklyn"
I recently ordered S. T. Joshi's The Assaults of Chaos: A Novel about H. P. Lovecraft from Hippocampus Press. Naturally, since I'm an admirer of Lovecraft's fiction, I'm well aware of Joshi's eminence as the world's leading Lovecraft scholar. Consequently, I thought it might be fun to read Joshi's fictional portrayal of Lovecraft. The hardback edition was only twenty-five dollars. That's not much to spend on what could prove to be nothing more than a curiosity. We'll see. Much to my surprise, however, my order included a little bonus, a Depression-era mystery story by Joshi entitled "Suicide in Brooklyn" that features a detective named Joe Scintilla. 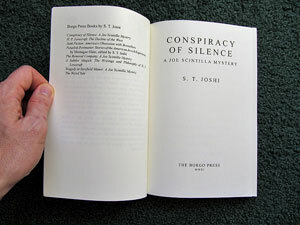 Apparently, Scintilla, who is said to have a degree in philosophy, has appeared in several books by Mr. Joshi. They're currently available from Wildside Press. I'm not a mystery reader, but I enjoyed "Suicide in Brooklyn" quite a bit. 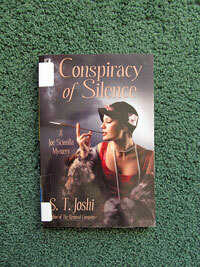 Mr. Joshi sets up a mystery  the apparent suicide of a young man from a wealthy family  and puts Scintilla on the case. I'm not giving anything away by saying that our hero comes up with a clever solution of the crime. I noticed that Joshi even cribs a bit from Lovecraft's biography: Scintilla's chief suspect, Frank Donelson, is said to have worked as a lamp-tester, just like HPL during his ill-fated sojourn in NYC in 1924-1926. As I said, I enjoyed the story. So now I'll have to track down the Scintilla books and read them. 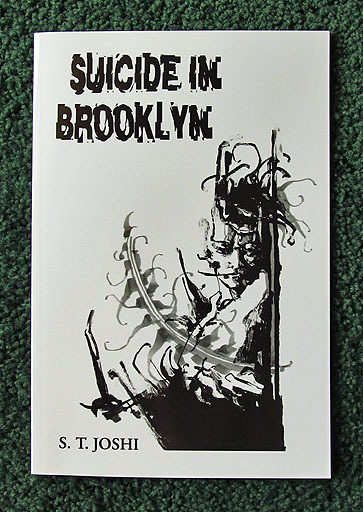 I've no idea whether or not "Suicide in Brooklyn" will ever be for sale on its own. Right now it seems to be available only to online purchasers of The Assaults of Chaos, or maybe it was available only to those who pre-ordered the book as I did. 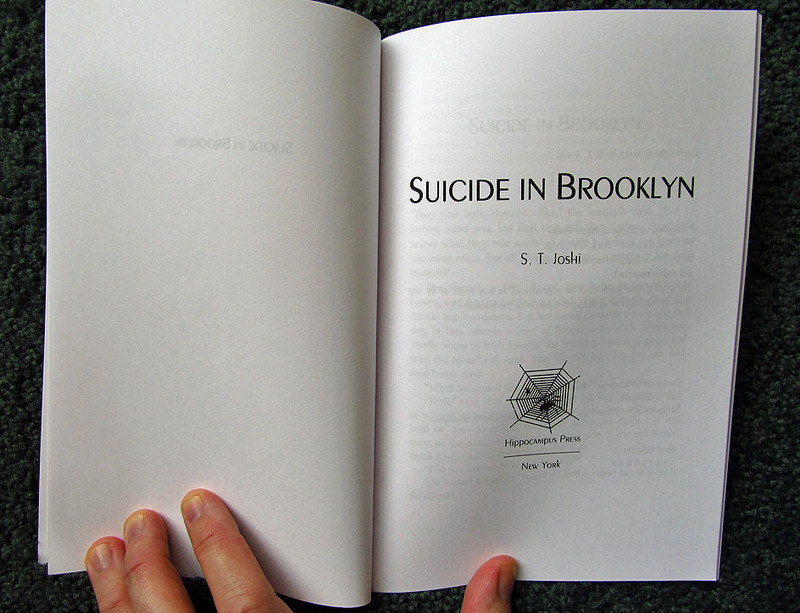 As a physical book, "Suicide in Brooklyn" is typical of Hippocampus Press paperbacks, i.e., sturdy and attractively designed. I'm looking forward to reading more of Joe Scintilla's adventures. And I'll have something to say about The Assaults of Chaos after I've read it. It's on my soon-to-read-and-blog list. 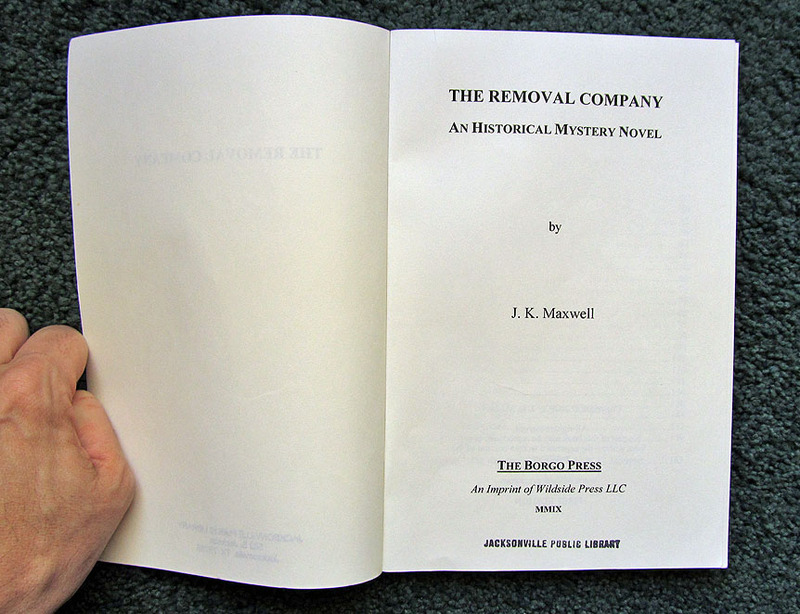 Update - October 8, 2013: I've uploaded a post about The Removal Company, the first book-length Joe Scintilla adventure.